Oyster happy hour in New York City is the happiest hour of them all, but did you know that oysters are oysome beyond their tastetacular, aphrodesiacal, delight-by-the-bite decadence? Like all bivalves, oysters filter the water they live in with superhero efficiency. (I think of them as the earthworms of the ocean, turning trash into eco-enhancing aqua treasure…but more on their magical poop below.) As an underwater community, oysters also provide habitat for marine ecosystems and buffer storm and wave energy, protecting the shoreline. For several centuries, oysters dominated New York City’s waterways, and the Big Apple was known as one of the oyster capitals of the world. Ellis Island was called Oyster Island before its name changed in 1770. During the mid-19th century, famished fans could head to an “oyster cellar” hub like Canal Street and have all-you-can-eat oysters for six cents. I had a shell of a good time speaking with Meredith Comi, Oyster Restoration Program Director. She and her team deploy innovative efforts to restore oyster population, including a very cool volunteer oyster gardening program. The New York Times has written about the group’s volunteer day at their 1-acre oyster reef in the South Bronx. Check out a few highlights from my chat with Meredith below! Q: How do oysters clean water? 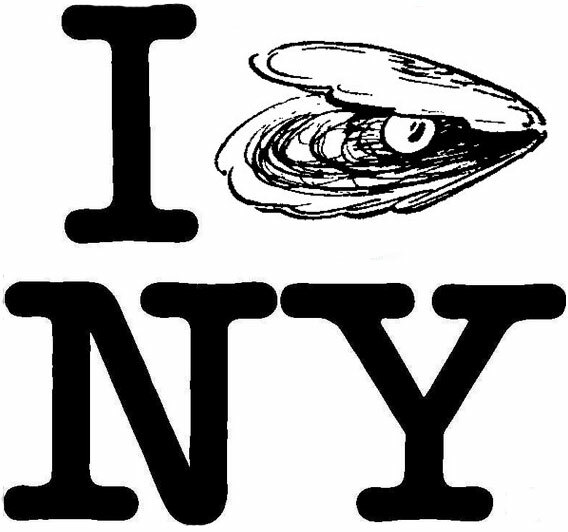 Q: What type of oyster lives in New York’s water, and what’s its history here? Q: Why did New York’s oyster population disappear? A: “We started having issues with the beds in the 1930s, maybe a little before that. In New York, there weren’t any sewer systems and everything went out into the water. The beds started dying and people were getting sick from eating these oysters. There were typhoid breakouts that were actually traced back to oyster beds. Plus, people were using oyster shells for chicken feed or to make buildings. But oyster larvae need to settle on something hard, they need to settle back on shells. By not putting shells back in the system, we were robbing the larvae of some place to settle. That contributed to the demise as much as the over harvesting. Q: New York is notorious for its archaic combined sewer system, in which waste and storm water share a single route to sewage treatment plants. When it floods, raw sewage overflows into communities and waterways. How has this affected oysters? Q: What are the challenges we face in restoring the oyster beds? Q: How can people get involved and contribute to NY/NJ Baykeeper’s efforts to restore New York and New Jersey oysters? Q: Do these efforts have a chance at restoring oyster populations to how it used to be? Want to help save New York’s oyster population? Learn about other ways you can get involved with NY/NJ Baykeeper’s efforts, from volunteering to contacting decision makers, by clicking here!